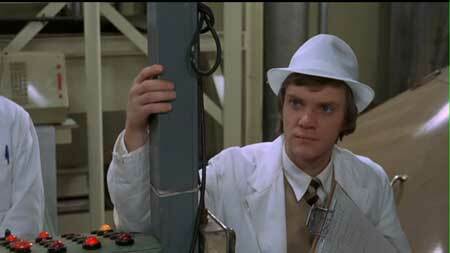 This is the first in a series of posts on Lindsay Anderson’s masterpiece, O Lucky Man! The other night, I revisited O Lucky Man!, courtesy of the recent DVD release, seeing it for the first time in its proper aspect ratio. While it isn’t so readily apparent in pan-and-scan versions of the film, Anderson’s subtle and very specific framings — which are often composed of medium and long shots — are as integral to the film as its many outrageous moments among its side characters. The coffee salesman and former if… revolutionary Mick Travis (played wonderfully by Malcolm McDowell) is often framed in the center of a tableau, and this positioning foreshadows Travis’s later victimization by political forces, both left and right. Travis’s first appearance comes at the end of a slow pan, where we see Travis in the middle of an orientation meeting at a coffee company. He’s paying very close attention to a supervisor who is training many salesmen for possible lucre on the road. He has a clipboard under his left arm. Travis’s right arm grasps a pillar, his bicep (and thus his strength) interestingly occluded by the beam, connected to an unspecified part of the corporate machinery that keeps the factory in motion. In addition to this conformist image standing in sharp contrast to if…‘s violent revolutionary, it’s suggested by this establishing shot that this Everyman figure is drawn moth-like to the machinery. Indeed, only minutes later, we see Travis calculating on a piece of paper just what kind of money he can make on the road. From the protagonist’s introduction, the imperialism observed in the film’s black-and-white prologue is indeed reflected by modern forces. And this is just the first of Anderson and screenwriter David Sherwin’s onslaughts upon contemporary culture. But what of the film’s opening title sequence just before Travis’s introduction? 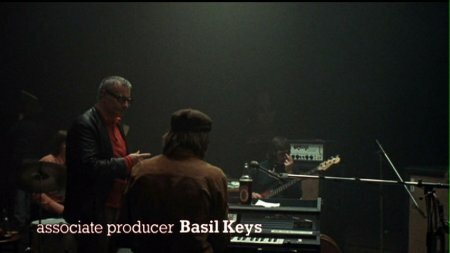 The film features numerous interstitial interruptions from Alan Price and his band, playing songs that often reflect and respond to Travis’s adventures. The effect is certainly reminiscent of a Greek chorus responding to the events on a stage. But since this is the film medium, there’s something fundamentally more surreal going on. The band also appears inside the movie’s narrative midway through the movie, as Travis flees from Professor Millar’s hospital. So the film’s technical enablers have just as sizable a role on Travis’s predicament as the forces of the world.